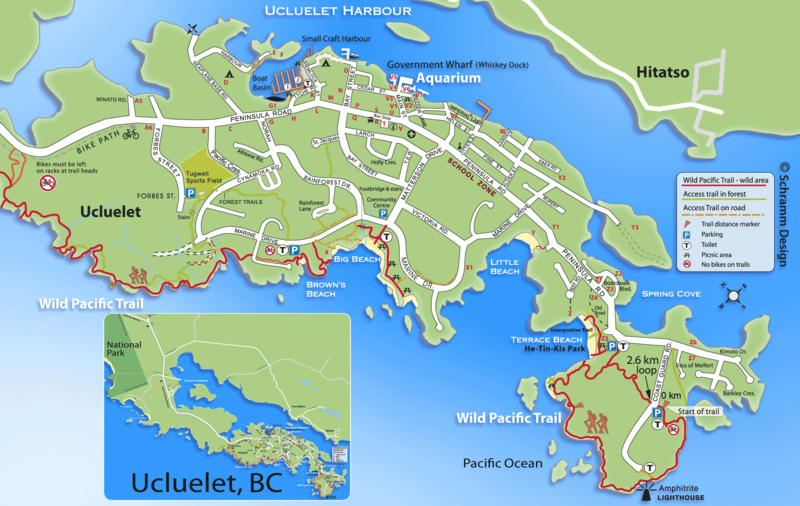 Ucluelet (“yoo-clue-let”) is a proud First Nations name meaning “safe harbour,” and it truly is a place of refuge. Accommodations match any expectation for an enjoyable stay on the fringe of Pacific Rim National Park. Choose from waterfront luxury suites, friendly family-run B&Bs or budget conscious motels. Wherever you stay, beaches and the famous Wild Pacific Trail are within walking distance. Enjoy the small, friendly feel of this seaside village where fishing boats still bustle up and down the deep harbour. Wildlife nature tours, Broken Group Islands cruises and kayaking trips launch from here daily. BOOK AHEAD for holidays or summer months. During peak season lodging is often fully booked. Restaurants and shops also abound year round. The Wild Pacific Trail is a world-class trail skirting the jagged cliffs of Ucluelet’s wild outer coast. The trail offers spectacular panoramic views overlooking the Broken Group Islands in Barkley Sound to the south-east and the open Pacific Ocean to the west. The trail is woven through wind-swept ancient rainforests, a natural treasure-house of gigantic trees, nurse logs, mosses and ferns. Photographers will especially appreciate the ever-changing moods of the ocean, dramatic lighting and artistic mist at every viewpoint. This trail is breathtaking year round from sunrise to sunset. Whales can be spotted all year (especially during the March-April Grey whale migration) and sea lions, seals, otters, eagles, deer and bears are often seen. Winter storm watchers enjoy the safety of the Wild Pacific Trail or Amphitrite lighthouse when waves are cresting to the height of large trees. The Wild Pacific Trail is aptly named because it traces the edge of cliffs and beaches for 8.6 kilometres on the Ucluelet peninsula (south of the national park). There are two main sections of trail. The Lighthouse Loop is 2.6 kms along dramatics wild cliffs with a side trail to Terrace Beach. The next section extends 5kms from Big Beach Park near a resort to the Artist Loops to the north.This trail is free, donations at the lighthouse support further trail expansions. Stay on the trail. Rocks may appear safe but waves can move faster than humans. Keep dogs on a leash. Photographers will greatly enjoy the colourful displays with a fascinating assortment of creatures on every surface. Video is especially rewarding when it is feeding time for the octopus. Watch this video to see a sampling. The hand split boardwalk is very rough and the dock is difficult footing not advised for the elderly. At higher tides the dock is also a scramble to the shore.